Doan Pham has been a student at Honolulu Community College since 2011, and his goal is to earn a bachelor’s degree in Computing, Electronics, and Networking Technology (CENT) at UH West Oahu. Doan was born in the south of Vietnam and moved to Hawaii in 2006. As a young child, he loved to figure out how things work — he took apart many toys to discover their secrets, although he was rarely able to reassemble them into working condition. 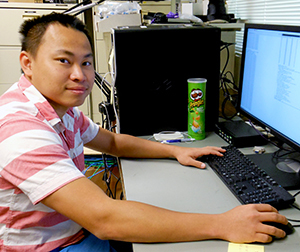 Now, Doan’s ultimate goal is to complete a PhD in computer-related field. During his free time, he enjoys playing computer games and solving puzzles. Project Abstract: The Gemini Observatory has four distinct, interconnected, high-speed gigabit TCP/IP networks, and a constant need to transfer large amounts data. Some technology experts believe that adjusting default network settings on a network of this speed can have a substantial impact on network efficiency, resulting in faster data transfers and reduced CPU utilization. The most common of these optimizations is the use of jumbo packets. Jumbo packets are a result of a change to TCP/IP’s Maximum Transfer Unit (MTU) setting from the standard 1500 bytes to something larger, like 4500 or even 9000 bytes. We started this project by researching the various jumbo packet standards and their potential risks and benefits. Armed with information, we then set up a testing lab using platforms that represent common hosts at Gemini, including Dell, Cisco, and Sun hardware running CentOS Linux, VMware ESXi, Windows 7, and Windows Server. We ran a battery of benchmark tests to establish CPU and network usage across a variety of MTU settings, then analyzed the results to see for ourselves whether this common industry recommendation would be a good fit for the Gemini network.